Radiology has undergone remarkable technical developments over the past years. State-of-the-art scanners can depict anatomical structures at previously unimaginable detail, while also providing functional information regarding pathologies. No matter how sophisticated our imaging techniques might be, our interpretation of results is still based predominantly on visual inspection. Radiomics is the process of extracting numerous quantitative image-based features from radiological examinations, to create large datasets where each abnormality is characterized by hundreds of different parameters. These parameters are used to create “big data” datasets, which can be analyzed using machine learning machine learning techniques to find new meaningful patterns and relationships in the data. Feuchtner G, Kerber J, Burghard P, Dichtl W, Friedrich G, Bonaros N, Plank F. The high-risk criteria low-attenuation plaque <60 HU and the napkin-ring sign are the most powerful predictors of MACE: a long-term follow-up study. 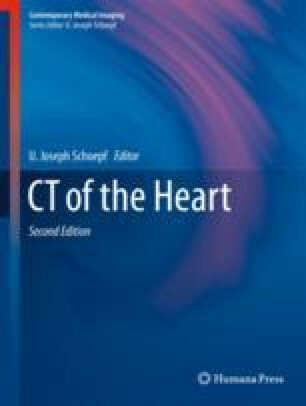 Eur Heart J Cardiovasc Imaging. 2016. https://doi.org/10.1093/ehjci/jew167. Symons R, Morris JZ, Wu CO, Pourmorteza A, Ahlman MA, Lima JA, Chen MY, Mallek M, Sandfort V, Bluemke DA. Coronary CT angiography: variability of CT scanners and readers in measurement of plaque volume. Radiology. 2016:161670. https://doi.org/10.1148/radiol.2016161670. Precht H, Kitslaar PH, Broersen A, Dijkstra J, Gerke O, Thygesen J, Egstrup K, Lambrechtsen J. Influence of adaptive statistical iterative reconstruction on coronary plaque analysis in coronary computed tomography angiography. J Cardiovasc Comput Tomogr. 2016. https://doi.org/10.1016/j.jcct.2016.09.006. Kolossváry M, Szilveszter B, Merkely B, Maurovich-Horvat P. Plaque imaging with CT – a comprehensive review on coronary CT angiography based risk assessment. Cardiovasc Diagn Ther. 2017. https://doi.org/10.21037/cdt.2016.11.06.